The world of the living can be divided into two large Consensus Camps, which both contain various subgroups and subcultures. I like to call the people from the first camp Team Zombie (consensus based on ignorance and media manipulation) and the people from the much smaller second camp, Team Gnosis. I’m usually busy experimenting on my own and never was one for team sports; I prefer to observe the teams but if I have to play, you’ll find me in Team Gnosis on the odd occasion. 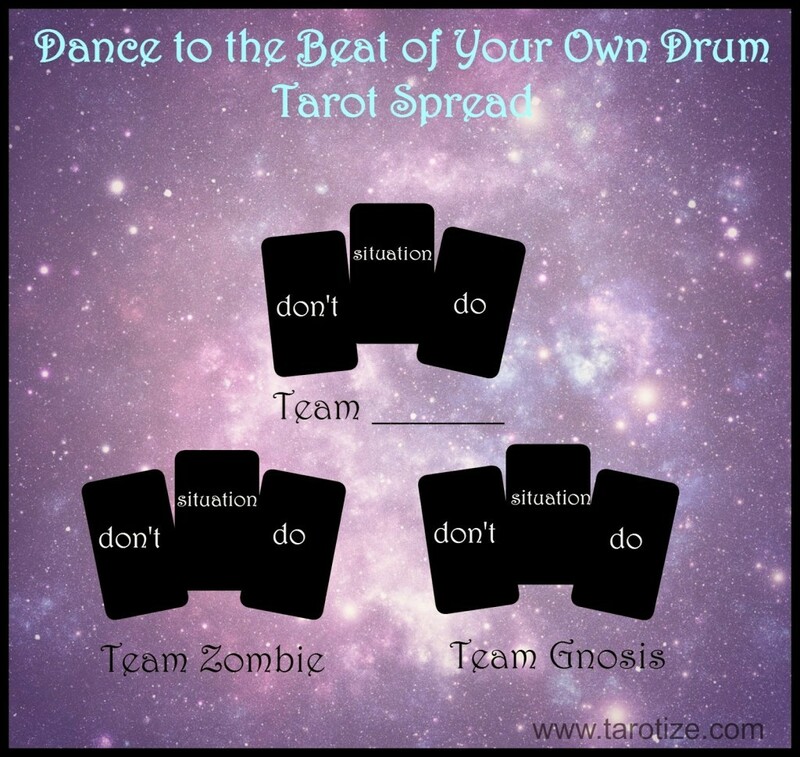 Today’s spread is one I have designed to help you find and dance to the beat of your own drum, because even if you are a team player and like to help out in Team Gnosis, you will have much more to contribute if you honour your own music. If you happened to stumble of onto this page from Team Zombie, I’d like to give you an extra warm welcome. The good news is that you don’t have to go via Team Gnosis to start dancing to the beat of your own drum… like The Fool, all you have to do is to WAKE UP and begin… and this is a great place to start! For this reading I used three separate decks: The Sirian Tarot, The Halloween Tarot and the Alchemical Tarot Renewed, but it is perfectly fine to use just one deck. The three cards at the bottom left are advice from Spirit how to interact with Team Zombie. 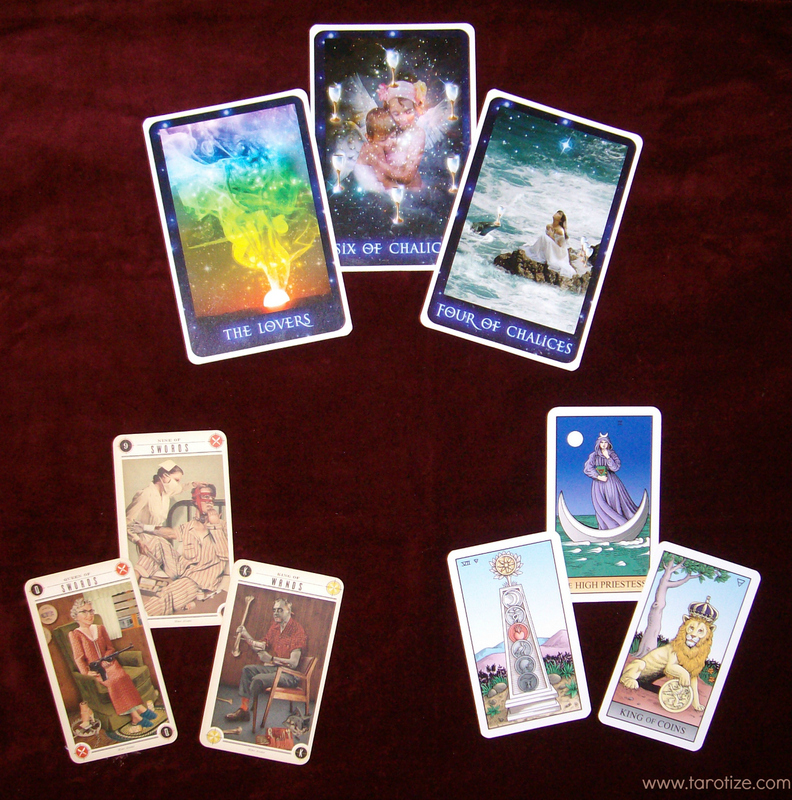 The three cards on the bottom right are advice from Spirit how to dance with the members of Team Gnosis. Team Lisa Cards: The first card (6 of Chalices/Cups) is a message from Spirit that I am loved and supported. My ancestors are telling me to not worry about relationships so much right now (left – Lovers) but to learn to be fully present in the now. The woman in the 4 of Chalices looks Home-sick in the sense that she doesn’t feel like she belongs here on Earth. It’s time go start really enjoy being here because there is work to be done! Team Zombie Cards: The first card made me laugh because nowhere do I have to engage more with the zombie mentality than in the so called ‘health care’ system. Just looking at the card here is putting me in a more humorous mind-set about it all, which is probably the only way to be when you have to deal with narrow-minded doctors. Jolly good because I also have the King of Wands on my side and it looks like he very much agrees with something I started doing recently in the pursuit of a stronger immune system, i.e. making my own stock from left over bones. Team Gnosis Cards: It’s no surprise that the High Priestess shows up here because it really is only the spiritual side of things that gets me interested in batting for Team Gnosis. My interest in the environment would be pretty much non-existent without Her influence too. The 7 of Pentacles as the ‘don’t’ card and the King of Pentacles as the ‘do’ card is telling me the same thing: I have to start believing that I can make a difference in the material world and it is probably time to lead one of the subgroups in Team Gnosis – I’ve been on the sidelines for too long… The time is now!